Three key takeaways for Toronto after riding the metro in Sweden's capital city. 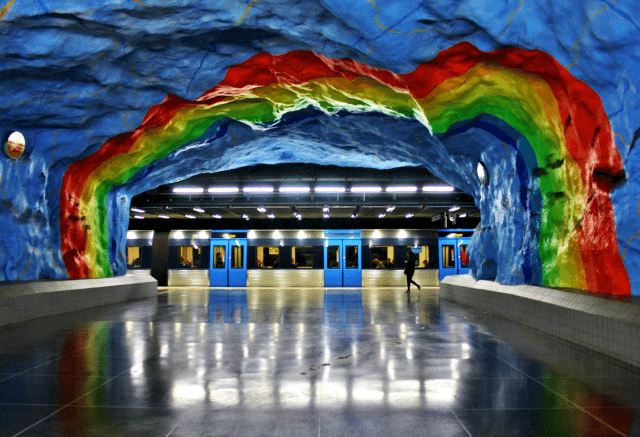 The cave-inspired Solna metro station in Stockholm is a favourite among the expansive network that has been regarded as the world’s longest art gallery with countless works throughout its 90 stations. Photo via Kochi Metro blog. A recent trip to Stockholm introduced me to a pretty fantastic transit system. I’m not going to jump on the Swedes-do-everything-right bandwagon—partly because I stayed with Swedish friends, who burst that bubble on several issues, and partly because my train to the airport was so delayed, I almost missed my flight home. Nevertheless, there is no question that Stockholm has a transit network Toronto could learn from. Stockholm is a city of just under 1 million people, at the heart of a metro area of about 2.2 million. Its climate is very similar to Toronto’s (it gets hot, it gets cold, it gets snow), and its topography as a set of islands is even more challenging, as it has to connect across several bodies of water. The municipality’s area spans about 215 square kilometres, within which it has a rail network of seven metro (subway) lines, four commuter rail lines, and nine tram/LRT lines, plus an extensive bus network and boat service. With no double-counting for interchanges, the rail lines alone have a total of 174 stations within the city limits. Toronto is almost three times larger, area-wise: 630 square kilometres, with twice the population at both municipal and metropolitan scales. Our rail network within the city, including GO transit and UP Express stations, has a total of 82 stations. If we add the streetcars, we would increase the stop count by 677, but I would argue that until we turn our streetcars into proper tram lines all in their own right-of-ways, with fewer, more well-spaced stops, it doesn’t serve the purpose of a proper rail line as in Stockholm. And even with the streetcar network, Toronto does not come anywhere close to a rail network covering the full expanse of the city as well as Stockholm’s does. A comparative number of stations would be 400 to 500. So Stockholm offers more and carries a similar number of passengers daily, despite being a smaller city. And they are still building and expanding. 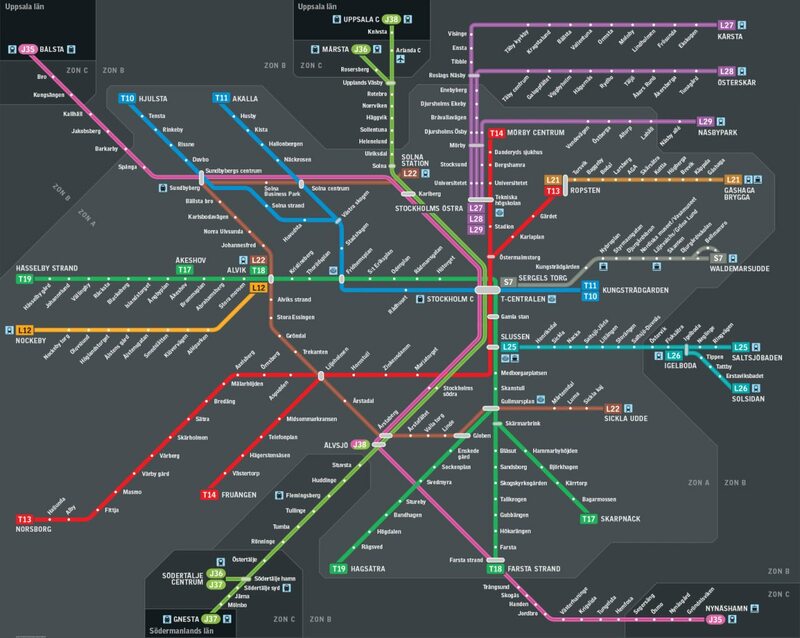 The system overlaps its lines as well, something that is missing from almost the entire TTC system. It doesn’t just have intersecting points, like a grid; there are several places where lines come together for several stops, usually through central areas, and then branch out in multiple directions. This overlapping provides several benefits. It increases service to central areas by having multiple lines serve the same place, when such a level of frequency would be unnecessary and possibly unsustainable (logistically and financially) on all lines. It provides greater flexibility for riders in designing their journey. It distributes ridership more evenly in central areas, instead of overloading one station or line. The design is found in the Stockholm bus network as well, and I’ve noticed this overlapping on bus networks in Dublin and London, too, where an individual bus stop offers options of several routes. Toronto has almost none of this. It’s very useful to get to the bus stop and have a choice of buses going in the same direction or a new one; it increases route options for many journeys and shortens waits considerably. Stockholm has also made its stations more beautiful. Almost every station I saw was not only well lit, but interestingly decorated. Some are quite elaborate. In some cases, the entire station is a work of art. It’s so good that they conduct art walks through the metro system. You can see some of the better examples in a Guardian photo gallery here. 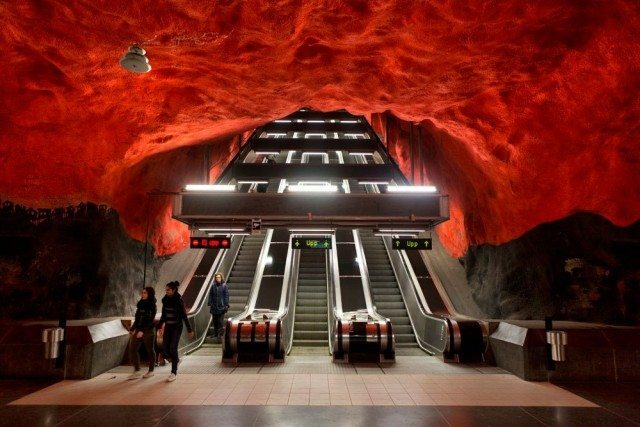 I think there’s something quite significant in beautifying transit stations. They are important public spaces. They have a functional purpose that must be central to their design, yes, but we should take them as seriously as social spaces as well, just as we would other public spaces such as squares or parks. The energy we put into making public spaces attractive and interesting, and thus places that people want to be, is an expression of how much we value and respect the public as a whole, that we value community and society. There’s no reason for a transit station to be dark and featureless. There have been some efforts to beautify the TTC: Pape, Ossington, Downsview/Sheppard West, Museum, and Dupont stations come immediately to mind as places where the decor is attractive or interesting, and some other new art installations are coming soon. The recent renovations to St. Clair West station have been an unfortunate step backwards in this respect: the new, additional tile that was installed with the elevators does not co-ordinate with the colours and style of the tiling in the rest of the station at all. This is a very interesting point: Stockholm used to have a zone system for transit fare, but as of this past January, it got rid of it within the city. When the suburbs were nothing but leafy enclaves of the well-to-do, charging fare by distance made some sense. But today, inner-city suburbs around the world just as frequently house poorer communities, who are already taxed in time by the distance they have to travel to access the central city. We ought not to add a further financial cost to that. A flat-fare system is the fairer way to go. That might be good thinking for Toronto: one fare within the city limits, another fare or set of fares beyond it. That would function as a kind of congestion charge between the city and its neighbours, but if it’s still cheaper, faster, and easier than driving, it is not likely to act as a disincentive to taking transit. Not all of the above is possible to implement in Toronto, and certainly not quickly. But it is always worth remembering that the way we do things in Toronto is not the only way, and often not the best way. The most significant obstacle to a better TTC is the underfunding of its operation and maintenance. We ought to demand better.